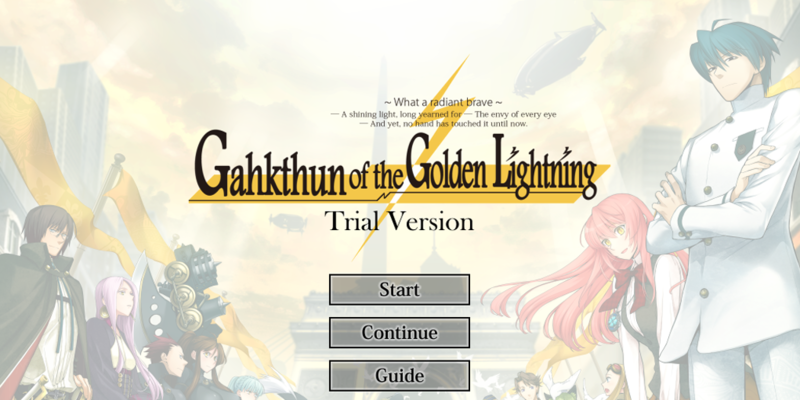 Gahkthun of the Golden Lightning––Demo Now Available! Hello everyone! Today we’re releasing a demo for the upcoming title Gahkthun of the Golden Lightning, and I thought I’d take this opportunity to go over the game’s basic flow and some of its less typical mechanics. Gahkthun is an episodic game, divided into a number of “chapters” that are fairly complete in their own right, but also contribute to the game’s overall story arc. New chapters often introduce new characters and new cases for the 72-year-old (?) superpowered detective Nikola Tesla and his assistant Neon Scalar to investigate. Our demo contains Chapter 3 and Chapter 1, which together should give you a nice introduction to the world and style of this unusual title. While Gahkthun as a whole is a linear experience, that doesn’t mean the player has no role in its progression. 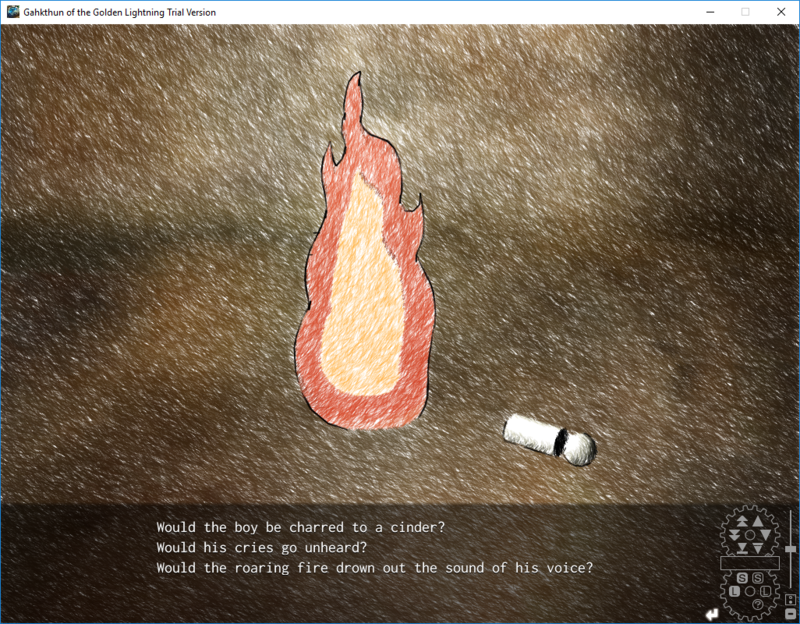 Every chapter generally features a pair of interactive “exercises” for the reader: brief storybook tales closely related to ongoing events that conclude with a timed choice between four options. Choosing too many “incorrect” answers in one chapter will result in a game over. 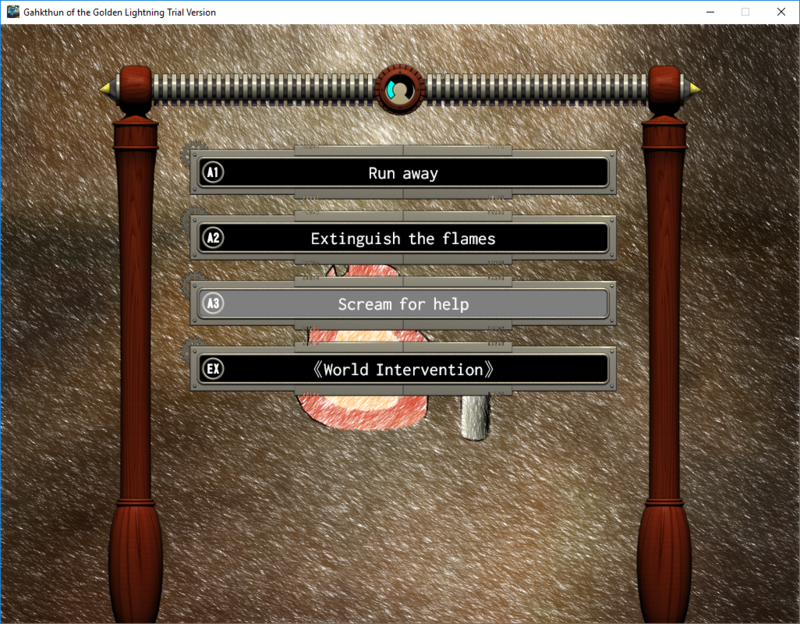 If you’d prefer to proceed through the game more smoothly, the “World Intervention” option will allow you to continue with a little help from Nikola Tesla; failing to make a choice in time will cause you to automatically select this option. Please note that relying on Tesla’s assistance will not unlock any of the additional content. In addition to their gameplay function, those who read these somewhat cryptic stories attentively may find they provide hints at background information not explicitly provided in the main flow of the game. One other notable game feature, included in full in our demo, is the “Encyclopedia” – a sizable glossary of terms, locations, and background historical information that can help acclimatize any new visitors to the universe of Hikaru Sakurai’s Steampunk Series. 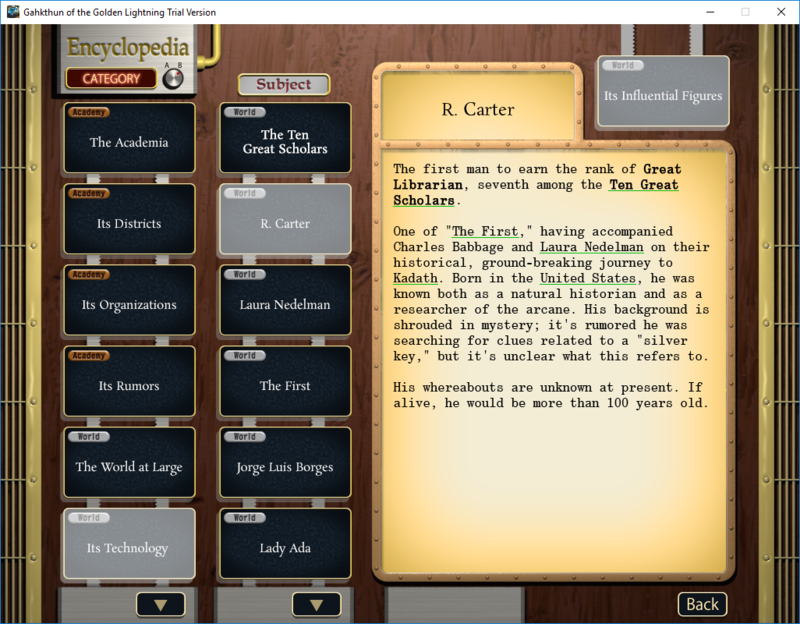 You can access the encyclopedia from the main menu, or by hitting the “question mark” button in the text box when available. While it certainly isn’t necessary to read through all the information contained here, it can provide interesting details and bits of context for the curious reader. There are no explicit “spoilers” here, so feel free to poke around. Before you begin, I do want to note that the demo jumps around a bit chronologically compared to the full game, allowing us to provide a somewhat representative slice of content. This shouldn’t lessen your enjoyment of the game, but it’s worth keeping in mind if you feel a little disoriented at first. You can find the demo here. I hope you enjoy this free introduction to Gahkthun; if you like what you read, please consider preordering the game. Tagged demo, Gahkthun, liarsoft, steampunk series. « euphoria Now On Sale! Noticed cursor flickering when moving around. It’s changing from game’s to system’s on Windows 7, regardless of screen mode. The trial installs fine, but the processes for the launcher stall after clicking them; so does the uninstall. Is there any reason that would happen?